How does one combine the gains of the so-called “Western” doctrine of God with the demands of spirituality and relating to the divine persons? How do we avoid collapsing the unity into a pantheistic oneness (ala Meister Eckhardt)? 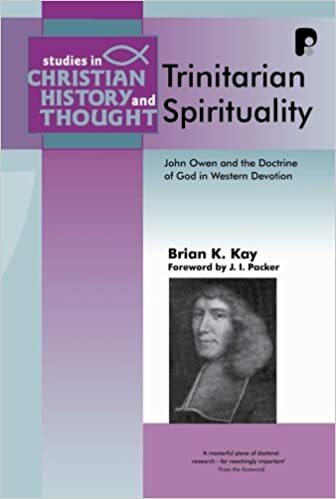 It is John Owen’s genius, so argues Kay, that we maintain the gains of the Western doctrine while simultaneously relating to the three persons. Kay hints at his conclusion but doesn’t fully develop it at this point: instead of “narrative theology,” which while helpful in capturing the dynamic movement of revelation, negates any need for space-time fulfillment. Rather, we should follow the drama of the Covenant (Kay 38). Contra Nietzsche, a robust covenantal reading of Scripture means our “values” aren’t timelessly Platonic, but eschatologically appropriate (40). For Owen there is an order of the divine communication: the Father’s love is the fountainhead, person and mediation of the Son is the substance, and the Holy Spirit infuses light et al (69). And now Kay comes to the heart of the problem–given the West’s emphasis on the unity of the divine works ad extra, how do we account for issues like the Father’s speaking to the Son (John 12:23) and larger issues like the Covenant of Redemption? I think throughout the book Kay hints at an answer: the drama of the divine covenants structures our language of the works ad extra, and so this isn’t a problem. I think this is a tension but not an insurmountable problem. In any case, it shouldn’t detract from Kay’s practical conclusions. Our communion flows from our union. This contrasts with the medievals who reversed the order by placing “union” at the top of a ring of increasing levels of communion (118). This book is very well-organized and argued. I don’t think Kay solved all of the problems. I would have liked to see more discussion of Barth’s challenge to the Covenant of Redemption. Nonetheless, while his thesis is quite good, it is the side issues that are extremely fascinating. My copy of Owen was from his Works, volume 2. Nonetheless, this review will also serve for the shorter Puritan Paperbacks edition. following the review is an outline on the book. This isn’t the most concise treatment of the issues, but Owen is quite fine in his own way. His writing is only difficult when he gets off topic (as in his otherwise fine Vindication of the Trinity at the end of the volume). Some in the YRR make it seem like Owen is borderline incomprehensible. He isn’t. Definition: A mutual communication of such good things grounded upon some union (Owen, II:8). The person of Christ, as head of the Church, communicates grace to us via his Holy Spirit, to the members of his body. Our communion with God is his communication of himself to us, flowing from our union which we have in Christ. The saints have this communion with the Trinity. Moral and worship of God: faith, hope, love. For the Father: He gives testimony and beareth witness to the Son (1 John 5.9). The Father communicates all grace by way of original authority (Owen 17). The Son by way of making a purchased treasury (John 1.16; Isa. 53.10-11). The Spirit doth it by way of immediate efficacy (Rom. 8.11). Our communion with the Father is principialy and by way of eminence (18). There is a concurrence of actings and operations of the whole Deity in that dispensation, wherein each person concurs to the work of salvation. If we speak particularly of a person, it does not exclude other media of communion. God’s love is antecedent to the purchase of Christ. The apostles particularly ascribe love to God the father (2 Cor. 13). Love itself is free and needs no intercession. Jesus doesn’t even bother to pray that the Father will love his own (John 16.26-27). Amicitiae: love of friendship (21). That they make suitable returns unto him. 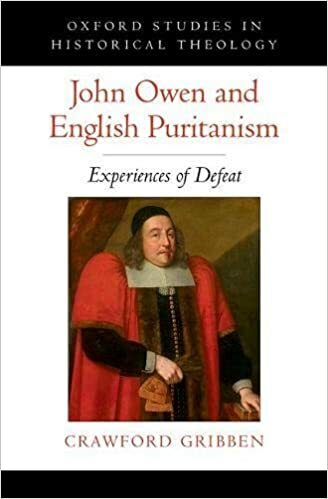 The relationship between justification and mortification is cause and effect (Owen 6). Our duty: The choicest believers, who are assuredly freed from the condemning power of sin, ought yet to make it their business all their days to mortify the indwelling power of sin (7). The efficient cause of this duty: The Holy Spirit (“if by the Spirit”). Mortification must be done by the Spirit. Every other way is vain. What are the deeds of the body? The body is the seat and instrument of the corruption of our nature (7). It is the same as “the old man” and the “body of sin.” The power of our spiritual life depends on how much we mortify the deeds of the flesh (9). We are obligated by the ferocity of the battle to be killing sin at all times. Indwelling sin is always with us even if judicial sin is negated. This sin is still active. If left alone, it will turn into greater sins (“scandalous and soul-destroying sins”). Our new nature and the Spirit is the principle by which we oppose sin. Our participation in the divine nature gives us an escape from the pollutions of the world. If we neglect this duty, our soul is cast into a contrary condition. It is our duty to be perfecting holiness in the fear of God. Conclusion: notwithstanding our judicial freedom from sin, indwelling sin remains in the best of believers. The ways and ends of their mortification were never insisted on by God. The means that are appointed by God, and which they do use, are not used properly. Fasting is important, but it should flow from the Spirit’s work of mortification. Fasting and watching are streams, not fountains. The Spirit will take away the stony heart (Ezek. 11.19; 36.26). This is a gift of Christ, and Christ, as the head, communicates his gifts to us. How does the Holy Spirit mortify sin? He causes our hearts to abound in graces and fruits that are contrary to the flesh (Gal. 5.19-21). The Holy Spirit, as our efficient, hits sin at the root. He brings us into communion with the cross of Christ. The vigor of our spiritual life depends on mortification. Success in mortification won’t always lead to happiness, though. A godly saint can mortify sin yet still face assaults (Psalm 88). Mortification shouldn’t be confused with the privileges that flow from adoption. Unmortified sin weakens the soul (Ps. 38.3). As sin weakens, so it darkens the soul. Mortification prunes all the graces of God. What it is to mortify a sin. A habitual weakening of it. Constant fighting and contending against it. Unless a man is a believer, truly ingrafted into Christ, this isn’t possible. It is the work of faith (Acts 15.9). Without sincerity and an aim at universal mortification, no lust will be mortified. God sometimes suffers one lust to chasten our other negligences. A lust that isn’t “loud” is often more dangerous. It could be a sign of inveterateness. The heart often engages in self-deception. The power of sin is weakened by grace, but not always the guilt is weakened. Load your conscience with the guilt of sin, so that you can let the Spirit work through you. Don’t fight guilt by your own righteousness. Let the law do what it is supposed to do. And then cry to God. It reminds us how weak in prayer we are. Even at our best we have feeble notions of God. We have words and notions about the “things of God,” but not the things themselves. But what of the difference between believers’ and unbelievers’ knowledge of God? Their manner of knowing is different, not the content. If you are upset by sin, don’t speak peace to your heart until God speaks. If we look for healing and peace, we must look to the blood of the covenant. How shall we know that God has spoken peace to us? We’ll know. When God gives peace, he doesn’t go halfway. But he doesn’t necessarily do it right away. Have faith that Christ is at work killing our sin. Expect in faith for a relief from Christ. Reveals unto us the fullness of Christ for relief. Establishes the heart in expectation of relief. Brings the cross of Christ into our hearts with its sin-killing power. Is the author and finisher of our sanctification. Supports our addresses to God. (Turretin goes through the standard pre-modern reasoning). Turretin clarifies the question by saying God is one in the sense that there is nothing else like him. It is a question of essential numerical unity. Fifth Question: Can the Divine Attributes really be distinguished from the divine essence? We deny against the Socinians. Seventh Question: The Simplicity of God: Is God most simple and free from all composition? We affirm against the Socinians. Simple is used in two senses, either absolutely or relatively. Absolute means not mixed with anything else. God is simple because he is not dependent. If something is of composition, then it was composed by another (or depends on something else for its existence). Also proved from the nature of subsistence. Persons and essence are not related as real component extremes from which a tertium quid may arise. This would create a quaternity. Modes/subsistences only modify, they do not compose. Modes distinguish the persons but do not compose the essence. Tenth Question: The Eternity of God: Does God’s eternity exclude succession according to priority and posteriority? We affirm. His essence cannot admit succession. Twelfth Question: Do all things fall under the knowledge of God, both singulars and future contingencies? Perfectly: he knows all things by himself or by his essence, not by forms abstracted from things. Undividedly: He knows all things intuitively and noetically, not discursively. Time: past, present, and future. State: necessary and free or contingent. Proof: all things are naked and open to God (Heb. 4.13). He knows hairs on our head. Etc. The Real Issue: Does God Know Future Contingencies? There are two ways a thing can be contingent: either it is produced by God (true by definition; all things contingent in this sense) or it depends on the prior causes of other contingent events. Proof: “Lord, thou knowest all things” (John 21:17; 1 John 3:20). Known unto God are all his works from the beginning of the world; God knows all his works from eternity. All things are naked and open to his eyes (Hebrews 4). This includes future actions. God predicts future contingent things. Things can happen necessarily as to the event (per the decree) and yet contingently as to the mode of production (section 23). Thirteenth Question: Is there a Middle Knowledge in God between the Natural and the Free? We deny. God’s knowledge of vision (Or free): Knowledge of future things. Definite because fixed by his will. Middle knowledge seeks to be about hypothetically possible things. Statement of the question: all admit that God knows future contingencies. Is there a special decree concerning the certain futurition of this or that thing preceeds so that God may see things antecedently to such a decree. We deny. Proofs: natural and free knowledge embraces all knowable things and entities are not be multiplied unnecessarily (sec. 9). 2) Things not true cannot be foreknown as true. 3) Such a knowledge posits a reason for predestination apart from God’s purpose and good pleasure (eudokian). 1 Sam. 23:11 no proof of MK. This is more of a revelation of “circumstances on the ground” than a hypothetical future contingency. Fourteenth Question: The Will of God: Does God Will some things necessarily and others freely? We affirm. Fifteenth Question: May the will be properly distinguished into the will of the decre and of precept, good purpose (eudokias) and good pleasure (euarestias), signified, secret, and revealed? We affirm. God’s will is simple but it may be apprehended as manifold. Decretive will: futurition and event of things; rule of God’s external acts. Will of eudokias (good purpose): that which seems good for the Father to reveal. Also our predestination. Will of euarestias: frequently referred to the preceptive will. That which we are to conform to. Beneplacit will: answers to the decretive will. Will of sign: answers to the preceptive will. There aren’t contrarieties between the two because they do not will the same thing in the same manner and respect (sect. 18). The will can be called the primary rule of justice extrinsically in reference to us, but not intrinsically in reference to God. In other words, some things are good because God wills them (e.g., the ceremonial laws) God’s natural justice is antecedent to his free act of will. Nineteenth Question: Is Vindicative Justice Natural to God? Scripture. Ex. 34:7. Hab. 1:13. If hatred of sin is necessary to God, then penal justice is equally necessary because the hatred of sin is the constant will of punishing it. Our redemption through the death of Christ. Twenty-First Question: The Power of God? What is the omnipotence of God and does it extend to those things which imply a contradiction? We deny. The object of God’s power is nothing other than the possible (sect. 6). A contradictory is logically impossible. God can do contraries, but not contradictories. Twenty-Third Question: The Holy Trinity. What are the meanings of the terms essence, substance, subsistence, person, Trinity, etc.? Subsistence: “marks a mode of subsistence or personality” (sect. 5). Person: it is properly concrete and not abstract. Property: the mode of subsisting by which this or that person is constituted (sect. 14). Twenty-Seventh Question: Can the Divine Persons be distinguished from the essence, and from each other, and how? They differ not essentially, but modally (sect. 3).